Opting out of the patriarchy in Tiptree and Russ. "This will never be found. Who am I writing for, then?" Following on from my essay last week about feminist separatism in SFF, I wanted to move on to look at two stories which rely on women "opting out" of patriarchy not on a separatist societal level, but on a destructive, individualistic one. 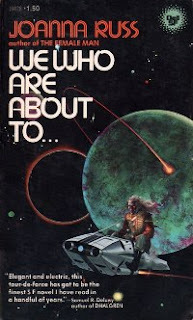 These are "The Women Men Don't See", a novelette by James Tiptree Jr. (also known as Alice Sheldon), published in 1973; and We Who Are About To..., published in 1976 by Joanna Russ. Each story offers a different perspective and tone to what is ultimately the same question: what does it take to truly escape from patriarchy? I'm nowhere near well read enough to make authoritative sweeping statements like this, but I'm going to go for this one anyway: The Women Men Don't See must be one of the best and most timeless genre stories out there today, not to mention one of the most riffed-upon story titles (although, frankly, almost every title in the Her Smoke Rose Up Forever collection is excellent). 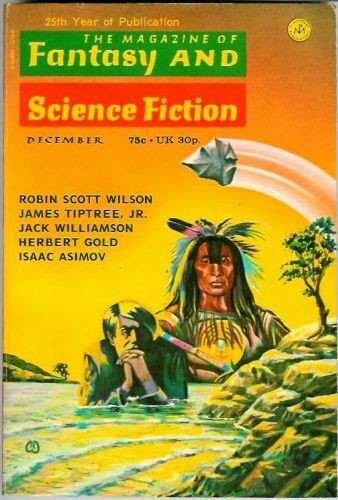 It's a title that's hard not to link to Sheldon/Tiptree's own status maintaining a cis male cover identity in science fiction, while presenting as female in her daily life. That "The Women Men Don't See" manages to be a successful and readable-in-2018 story is even more impressive given that it contains an utterly insufferable male narrator, through whose flawed lens the real story is filtered. Don Fenton is a man travelling through Central America on his way to a fishing spot in Belize (except, of course he isn't), when a change of plans puts him on a plane with a mother and daughter on their way to Chetumal. When the plane goes down, Don, pilot Esteban, and the two women - who we gradually learn are called Ruth and Althea Parsons - find themselves stuck in the jungle, and after taking a trip away from the plane wreckage for supplies, Don and Ruth find themselves even more isolated with each other. The mundane aspects of the story take what to Don - and therefore the reader - comes across as a complete left-field shift into the supernatural when a speedboat full of aliens comes to collect them. Ruth has made contact with these aliens, and has seen in them an escape from the patriarchal structures in which she and her daughter must operate. Don Fenton's narration puts a filter of misogynistic, racist sleaze over nearly every event in the story. He is outright objectifying towards Captain Esteban, constantly referring to his Mayan heritage through odd remarks about appearance and discussion of outdated, stereotypical customs. Indeed, Esteban is probably sexualised more than either of the Parsons: although Don does get in an early opinion on Althea -- otherwise a largely absent player in the story -- and spends a fair bit of time thinking nasty things about Ruth while the two are stranded together. Within the novelette, Tiptree has limited space to bring nuance to the other characters, especially given the limitations of Don's viewpoint, and its only Ruth that really comes out as three dimensional, even while central mysteries around her actions remain. Ruth's conversation about the reality of women's lives is literally one of existence in the margins, where it is only possible for women (note, both of these stories are very binary) to operate in the cracks left behind by male power and violence. This position is perhaps a little lacking in intersectional nuance, given that Ruth is a white woman who has been able to raise a daughter alone with money left over to charter a plane in the Yucutan, but it's one that fits the story to great effect: you can almost feel Don winding up the smug retorts for a conversation about "women's lib", only to be shut down by a woman who completely fails to follow her side of the script. What's most fascinating, and repulsive, about Fenton is that his narrative is told in past tense - he is telling us a story with the foreknowledge of what these women will do - and yet he is still incapable of centring them in the story, or of reevaluating their emotions in light of the information he gains at the end. At one point, after being stranded with Ruth Parsons for a day, he watches her gutting fish and marvels at her strength and resourcefulness, before literally dismissing it: "I blink away the fantasies and see a scared little woman in a mangrove swamp". Yet, it is this woman who defies Don (and his gun), makes contact with an alien species and leaves the planet and the patriarchy behind, an unthinkable act for the actual patriarch. 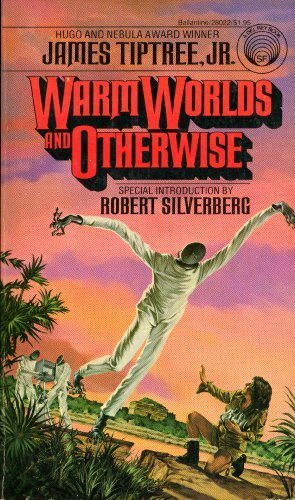 It's a highly effective way to underline the point about coexistence, and I can only assume from the fact that this story didn't blow Sheldon/Tiptree's "cover" that it's a believable portrayal of a man by someone writing as a man, at least in the context of mid-70s science fiction. 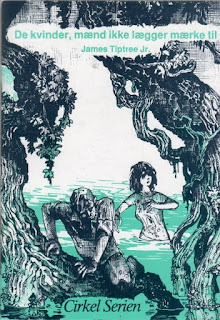 While Tiptree's characters only crash in the Yucutan, Russ sends her castaways much further afield. The narrator of We Who Are About To... is a passenger on an automated spaceship that crashes, stranding eight passengers (five female, three male, the only demographic detail the book feels the need to aggregate) on an uncolonised planet with limited supplies and no hope of rescue in their lifetimes. The narrator is immediately fatalistic about the group's chances of survival, which rubs up against the optimistic colonising spirit of the rest of her compatriots. Within days, they are attempting to set up long-term plans for childbirth (discussing the ideal "rota" to ensure genetic diversity before even establishing safe food and water supplies) while she seeks the most painless, drug-assisted way to kill herself. Compounding the difficulties Russ' narrator has with her fellows are their quickly evolving relationships with each other: initially, a black woman called Nathalie emerges as leader, using her intelligence and willingness to get things done to assert authority; however, she quickly ends up in a violent altercation with Alan, the youngest and physically largest of the men, who takes issue with her telling him what to do. The narrator laments that "patriarchy is coming back, has returned (in fact) in two days", and there's a clear sense of building tension as the interactions within the camp start to strain. Except, of course, this is a 100-page barely-novel, not a slow-burning social drama, and no sooner have these tensions been established than Russ' narrator's desire to die comfortable and alone is brought into sharp, fatal conflict with her fellow humans. Ironically, it's fatal for them first, not for her: after leaving with less than her share of resources to a nearby cave (travelling off on a "broomstick", no less), she is hunted back down by the remainder of the group, who try to punish her for her non-compliance. Despite the first person narration, we don't really get a sense of her emotional response to this; she not only kills the group who try to bring her back, but goes out of her way to shoot the last two women (an old, rich mother and her chronically ill, adoptive daughter) back at the camp as well. This takes place just over halfway through the book. The remaining half is her slow starvation, complete with hallucinations and meditations on her life and choices (though much remains obscured from the audience - in particular, we never learn what she means when she mentions she is "not exactly an amateur" at the "game" of dealing death). This makes for an unusually structured story, but one which allows for a great deal of depth to be given to the narrator's motives and thoughts as she processes what is happening to her, which come to a more personal climax towards the end of the book. 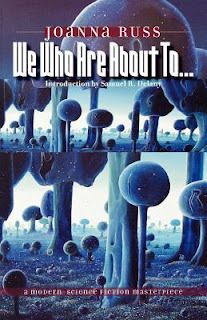 Taken purely from the perspective of the ends it achieves, Russ' narrator's violent rejection of her compatriots' survival plan is pointless: she herself notes the multifaceted absurdity of killing people who tried to kill her to stop her from dying, and her reasons for believing that the rest of them would have died as well are all too compelling. However, We Who Are About To... isn't about the narrator's choices, or even the outcomes of those choices, so much as the lengths she must go to in order to make them. Once she starts exploring that unwillingness to compromise, we also get hints at how this plays into her life before the spaceship, which one of her hallucinations characterises as "starving" in a parallel to her current end state. In the language of more recent media, the narrator is "non-compliant", and while it appears that her previous life in a technologically comfortable 21st century gave her the scope to live out her choices safely, its only in this hostile, isolated environment where "freedom" is truly possible - in what turns out to be the emptiest of victories. Its a choice Russ' narrator shares with Ruth Parsons, whose glimpses of past also hint at a life lived deliberately in the margins, out of the reach of male power. And, while the stories end in very different ways, ultimately they share a simple message: if you're inside the patriarchy, life without its influence is literally unknowable, both to the characters and to us as readers. The experiences they share are somewhat limited in their speculative scope - centring relatively privileged, well resourced women who have had certain choices to get to the "point of no return" they end up at - and neither offer much in the way of hopeful progress. 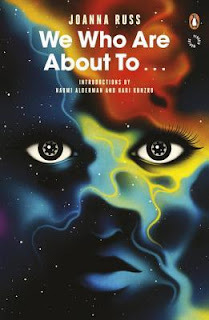 But both hold up very well today as vital, defining works from two of the most important voices in feminist science fiction from the 1970s, and are well worth looking up.